Gill Brite specializes in LED Landscape Lighting in NJ. After the sun goes down you can enjoy your hardscape by having built in LED lights in your patio or driveway. You can also light up your trees, outdoor ponds, and your home with the LED landscape lighting in NJ. With our expertise we can help you choose how to light up your home ourselves. LED lights are the best way to light your home and keep it more safe from burglars as well as tripping or falling when it is dark out. Coming home to a well lit home at night is the best feeling! No more late night falls or trips to the hospital. Keeping your home lit will lower the risk of robberies because it will look like someone is home and they won’t be able to break in as easily because it won’t be dark, so they will have no place to hide! LED lights are the new hip thing to have installed in your home! Place an order on our website today to get your LED Landscape Lighting in NJ today! Gill Brite is a wholesaler and retailer of LED Low Voltage Lighting in NJ. When your home is well lit it can give you a peace of mind knowing that when you are walking up to your home you can see and it won’t be dark. 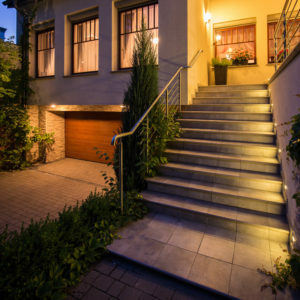 Safety should be your number one concern when it comes to your home so lighting up pathways, driveways, and patios is very helpful to keep you and your family members from stumbling and falling. By having your home light up you will be able to see if there is a burglar because of the lights being on they will be more scared to enter your home. Gill Brite wholesales and retails the LED Step Light in NJ. You are adding style and warmth to your home by lighting it up. It gives your home curb appeal as well as is inviting to your guests. For any suggestions contact 908-313-5220 for a consultation! We have excellent quality LED step light in NJ and we offer fast shipping! Within 24 hours of you placing your order we will have it shipped to you from our warehouse in New Jersey! Our prices are low and affordable, try comparing our prices and see how much you save! We have the best outdoor paver lighting in NJ. You can bring some light to your pavers by lighting them up with our outdoor lighting. By lighting up your landscape you are adding design and safeness to your home. We stand behind our quality and offer a 10 year warranty on our lights. If any of your lights break in the next 10 years or stop working, we will replace them for FREE! Imagine not having to worry about changing your lights for the next 10 years and having beautiful lights everyday when you come home. For beautiful outdoor paver lighting in NJ check out our inventory. As the demand for lights grows, our inventory and variety of lights will also grow! We put lights in pavers nj. By adding lights to your home you are increasing the security and safety of your home. Bring your landscape to light with outdoor landscape lights. With beautiful landscape lights your home will really shine when you look at it from a far. You are creating beauty at night. When you put lights in pavers nj you light up your walkway, patio, driveway, or steps and create beauty at night when you entertain your guests. Gill Brite specializes in landscape lighting in NJ. We install outdoor landscape lights into patios, driveways, and walkways. Our specialty is landscape lighting in NJ, we have the nicest in ground lights at the most affordable prices for wholesalers, retailers, and for installation. Right now we are just serving New Jersey as far as installation is concerned, but for selling we can sell to anywhere in the United States. We ship our LED Landscape Lights in New Jersey from our warehouse! This entry was posted in LED Landscape Lighting, LED Landscape Lighting in NJ and tagged Landscape Lighting in NJ, LED Landscape Lighting in NJ, LED Low Voltage Lighting in NJ, LED Step Light in NJ, Lights in Pavers NJ, Outdoor Paver Lighting in NJ on June 12, 2017 by GiLLBRiTE.